The Road to Rome, Part II: Why Not Lutheranism? You are at:Home»Learn & Live the Faith»Apologetics»The Road to Rome, Part II: Why Not Lutheranism? This is the second of six articles relating the writer’s journey into the bosom of the one, holy, catholic, and apostolic Church. Having succumbed to spiritual desolation following the rejection of his Adventist heritage, the young seeker investigates various Christian traditions, hoping to discover the Truth. Part I may be found here. So said I while I was investigating the varying forms of Christianity — and so we come to the second excursion in my journey towards Catholicism. Many years ago, I watched a film simply entitled “Luther”, starring Joseph Fiennes as Martin Luther himself. It was a powerful film, I must say, and I instantly bonded with the depiction of Luther as a man desperately seeking to uncover the truth. At the time, I had no substantial historical knowledge of Martin Luther’s life, of the Catholic Church, nor anything else – all I really had was a cursory knowledge of the subject in its entirety. Therefore, everything in the film appealed to me – Luther, in the film, was a man hunting for the truth at all costs. He stood up for what he believed in, he fought corruption, he was a gentle and kind soul but fearless and brave too. My experiences with Lutherans, too, were always very good. A friend of mine had invited me many times to an evening casual church service, and the pastor there was excellent. The message was always demanding upon the believer, fair, and intensely focused on the individual’s faith life. It meant a lot to me to be brought to that church back in those days, and it impacted me for the better. But I should return to the topic at hand. Despite all of my experiences with Lutherans, the actual history of Luther and the Lutheran movement was an entirely different thing to grapple with. Martin Luther, in actual fact, was not very much at all like Fiennes’ depiction of him in the film. Instead, as I read the pages of his works, I met with a much more confrontational character, someone who came off much more like an angry German Cicero than a meek and gentle man of truth. His controversial statements about the Jewish peoples, his words concerning the Peasant’s Revolt , these are words that cannot be ignored (but before the criticism is leveled, I do realize that many other famous Christians made rather coarse remarks in this vein at times, and yet are saints – here St. John Chrysostom comes to mind concerning his remarks about the Jews; however, Chrysostom did not start his own movement – Luther did). Now, there have been many questionable statements made by many figures in the Catholic Church – do not misunderstand me. Certainly, St. Jerome’s foul temperament has more than a little in common with Luther’s vitriolic letters. But St. Jerome does not represent Catholicism, whereas the Lutheran movement sprang directly from one man, Martin Luther himself. Granted, Protestantism in its proto-stages had already begun to take root in figures such as Wycliffe, Hus, and the like. 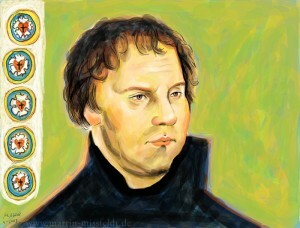 But the Lutheran Church sprang specifically out of this man, Martin Luther, and his doctrines and teachings. Therefore, to try to understand Lutheranism as a movement with no reference to Luther would be ill-advised. After all, the movement itself is named after the man. But to reference only some words of his that were controversial would be doing him a disservice. It is his theology that I am primarily not in agreement with. Much of my own disagreements can be found in any Catholic and/or Orthodox apologetic against Protestantism in its classical formulations. But his idea of sola fide is not in the Scriptures – at least, not in the sense that he meant it. This, of course, is why he wished to excise the book of James from the New Testament, as it directly contradicts the notion of sola fide. But then again, one could say that faith alone is what saves, but it must be a living faith. This, I believe, is an alternative way of saying faith and works. Nonetheless, I feel that it is Luther’s subjectivism that causes his downfall in terms of his theological positions, which later came to become the core rallying cry of the Reformation. Luther’s existential struggle can be seen on down through the ages, and I think it not a stretch in the least to state that most existential theology is a result of Luther’s own spiritual angst, and his struggle with his own sinful nature. In Luther, we come to the life of someone who seemingly was consumed in his sinfulness, and could find no strength in which to strive towards holiness – thus, we see him toss his hands in the air, declare that it is faith alone and nothing else that justifies. But if this is so, why does Scripture itself cry out against him? Is it not written, “Come, you blessed of my Father, possess you the kingdom prepared for you from the foundation of the world. For I was hungry, and you gave me to eat: I was thirsty, and you gave me to drink: I was a stranger, and you took me in: Naked, and you covered me: sick, and you visited me: I was in prison, and you came to me” (Matt 25:34-36), and “For by grace you are saved through faith: and that not of yourselves, for it is the gift of God. Not of works, that no man may glory. For we are his workmanship, created in Christ Jesus in good works, which God has prepared that we should walk in them” (Eph 2:8-10). But it is James the Apostle that cries the loudest, when he says that “even as the body without the spirit is dead: so also faith without works is dead” (James 2:26). Yes, it is faith that justifies, through grace – but it must be a living faith. But to return – it is my observation, then, that Luther allowed his own existential crisis to overwhelm him, and such, to me, is the essence of Lutheranism. In a way, it is a noble subjectivity that fuels it, and its notion of complete submission to the sovereignty of God is an admirable one. But its emphasis on the total depravity of the individual is rather alarming. Granted, this may have changed since the days of Luther – of this I am not certain, and can only speak of historical Lutheranism as a movement. In my opinion, Luther was a reactionary to some of the Church’s excesses of the time – not indeed, a pioneer so much of Protestant theology in itself (this would be Calvin, more or less), but rather the voice of its dissent against the corruption in the Church. Indeed, Luther’s rhetoric against the Church is so violent and vitriolic that his writings make for exciting, if rather crude, reading. Regardless, my view of Luther his theology is that it is not the faith of the fathers; it is not the faith of the early Christians, but rather one man’s struggle with God put into action, disseminated into revolt. This is not to say that the rallying call of Luther and the Reformation was entirely negative – not in the least. The Church needed a wake-up call, in my opinion. But I do not see any agreement between early Christianity, and Luther’s subjective interpretations of it – they simply do not agree with each other. The Lutheran movement was started by a man; I wanted the one started by Christ. Rather, if any Protestant tradition has caused me to question Catholicism, it has been the Calvinist/Reformed tradition. But this tale is for another time. Martin Luther himself (and I do not mean to imply an ad hominem here, but it is his controversial and combative nature that I find fuels his theology). The subjective nature of Luther’s teachings, as opposed to a faith that is ancient and rooted. The doctrine of faith alone I do not find in Scripture, but faith and works I do (or, in more ecumenical terms, a living faith that is proven by works). The idea that this particular kind of Christianity did not begin with Christ or the apostles, but appeared 1500 years later; there is no explanation of the gap. The notion that man is totally depraved and has no free will I disagree with for many reasons. I take a more compatibilist approach to it all, much more in the vein espoused by Boethius. The subjective starting-point of Luther’s theology amplifies the angst of man’s self-realized sinfulness, or, in other words, his fallen nature. The reversion to the basics of Scripture, especially as espoused in the Pauline epistles, in an age where hair-splitting scholasticism had begun to stagnate, and clerical abuse was rampant. The focus on immediacy of faith, as well as the sovereign mercy of God. Lutheranism has had its fair share of admirable mystics, theologians, and spiritual writers in Johann Arndt, Jacob Boehme, Philip Jakob Spener, Philipp Melancthon, Paul Tillich, Rudolf Bultmann, Soren Kierkegaard (who carries on the spirit of Luther in a most profound and authentic fashion), etc. thank you for this great article. It is respectful and sound and presents views with clarity and charity. It encouraged me to look again at the “JOINT DECLARATION ON THE DOCTRINE OF JUSTIFICATION by the Lutheran World Federation and the Catholic Church (http://www.vatican.va/roman_curia/pontifical_councils/chrstuni/documents/rc_pc_chrstuni_doc_31101999_cath-luth-joint-declaration_en.html). I read there “The present Joint Declaration has this intention: namely, to show that on the basis of their dialogue the subscribing Lutheran churches and the Roman Catholic Church are now able to articulate a common understanding of our justification by God’s grace through faith in Christ”.